It is with mixed feelings that I welcome the later flowers of summer. As we prepare to say goodbye to July and hello to August the shortening of daylight hours becomes more obvious. It is still summer but the first signs of autumn are waiting in the wings. We have been blessed with warm nights so far but a few mornings I have been greeted by silvery webs on the lawns. Some late flowers have been reaching top speed for some while now, thanks to the mild and early spring. Heleniums are not going to have much left for September and eupatorium are already in full party. Even vernonia is showing buds. Annual asters are starting to open their flowers, which will be welcomed by me to add some variety to the cut flower bunches, and last week the first annual rudbeckias opened, just a few days ahead of the perennial ‘Goldsturm’. These annual rudbeckias are wonderful plants (apart from the nasty, dwarfed kinds such as ‘Becky’). They are gutsy plants with big leaves and stiff stems that seem to withstand anything the weather or pests throw at them, but beware slugs and snails which will destroy your young plants despite the rough hairs on the leaves and stems. Among those I am growing this year are the wonderful ‘Aries’, which I thought was so good last year I had to grow it again, and ‘Irish Eyes’. Both are varieties of Rudbeckia hirta, North American prairie native, which, though potentially a short-lived perennial should really be considered an annual in the UK. Yes, a plant may survive and grow again the next season but they give so much in their first year that it is unnecessary to make them go through the whole performance again. 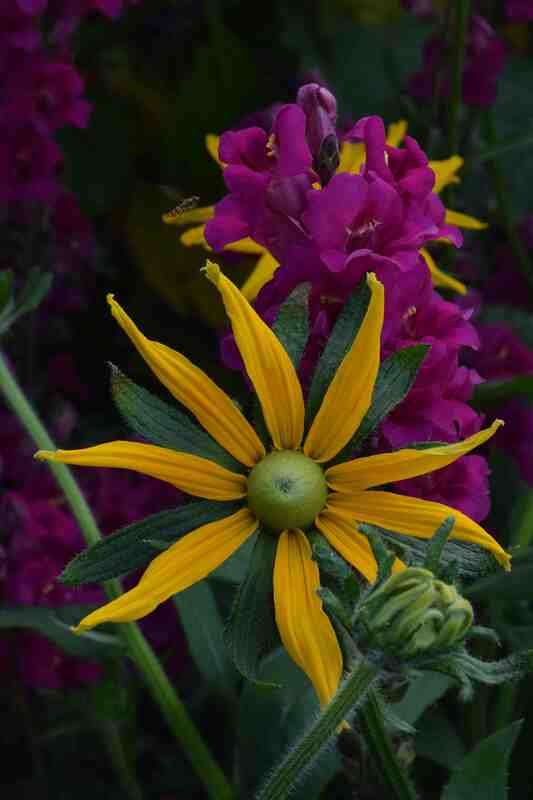 Rudbeckias are easy enough to grow from seed as long as you take care of two issues. Firstly the seeds need light to germinate so you should cover them only with the thinnest layer of compost or use perlite to cover the seeds (as I do). And then you must be really careful not to overwater them as soon as they germinate. This means never firm the compost before sowing and ideally add perlite to the compost so it is loose and free draining. I find that the tiny roots will die if the compost is wet and cold and although you can often coax the damaged seedlings to grow and produce side roots it is best to avoid the problem. So, my ‘Irish Eyes’ were planted out in late May and have grown strongly since. I like the plant for its coarse growth and long stems. 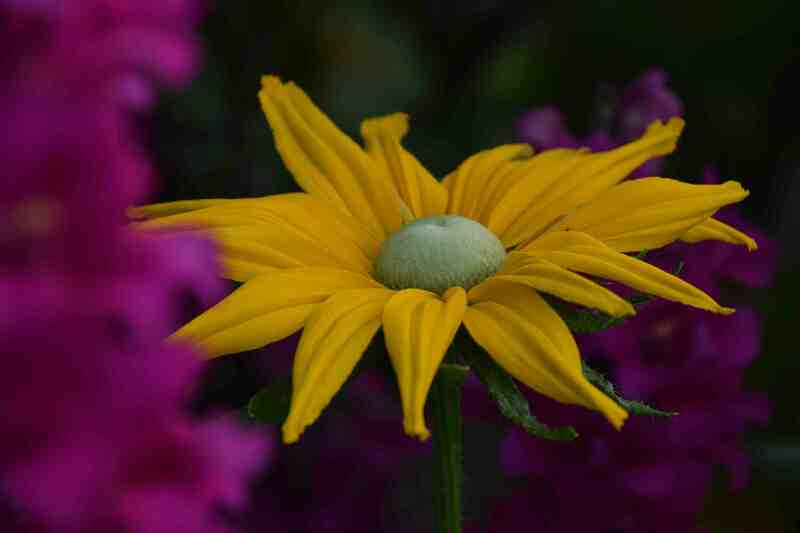 Some rudbeckias have thin stems and are delicate but, despite the poetry of its name, this is a bit of a brute with large leaves 20cm long and really thick stems, sparsely branched, holding large golden flowers up to 80cm above the soil. Although this is apparently a Fleuroselect winner, it seems to be very variable and I am not quite sure whether my plants are typical or not. Certainly lots of photos of ‘Irish Eyes’ seem to be more like ‘Prairie Sun’ which is a more sophisticated plant with more, smaller blooms that have more petals and are paler at the outer tips. ‘Irish Eyes’ is often recommended for containers but I don’t really agree with this unless it is a big pot. It is too rangy, it blooms too late and it is too tall to give the kind of effect I would want. 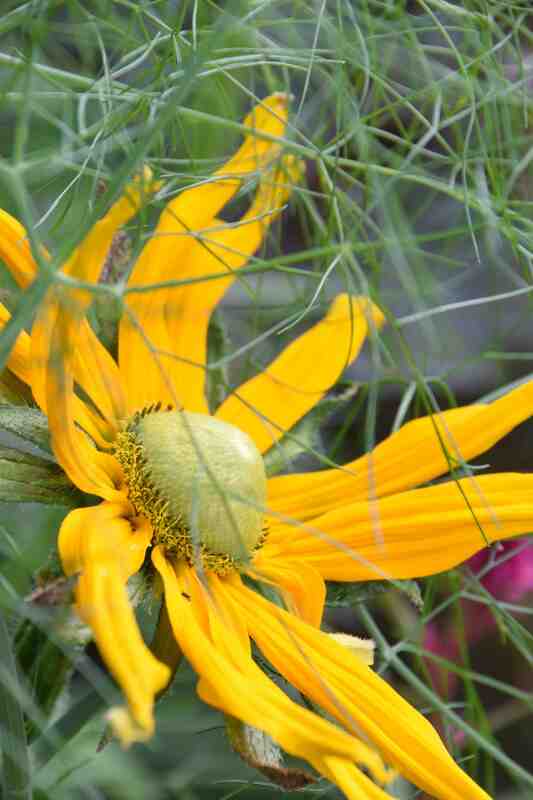 But if you have a 1m high terracotta pot and you plant it with grasses, fennel and this rudbeckia you could have a ‘prairie’ effect 2m high in total. Impressive. The biggest blooms, on the tall, central stems, seem to have fewer ‘petals’ than the later flowers but are almost 20cm across. 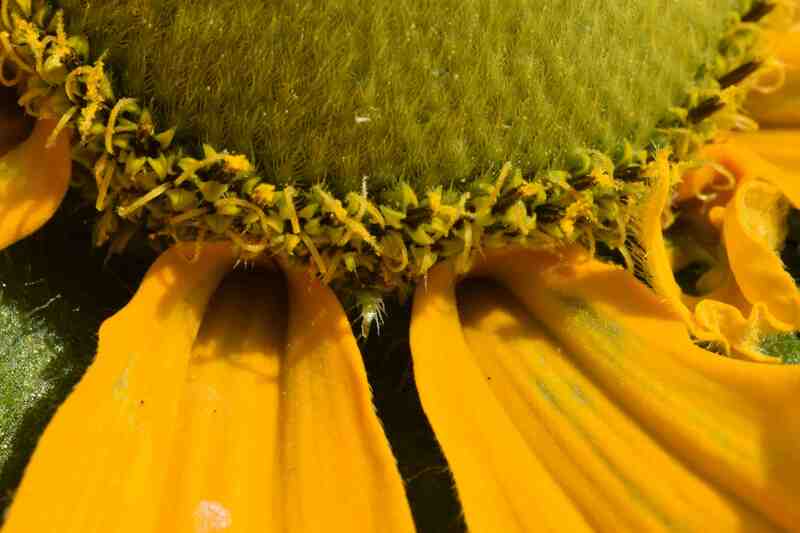 Close examination of the central area shows all those ‘disc florets’ (remember that each ‘flower’ is actually made up of thousands of tiny, individual, five-petalled flowers) with two-lobed sigma but also feathery green bracts that cover the unopen flowers and give this variety its unusual green eye. My seed was obtained from Unwins Seeds. Thanks 🙂 That antirrhinum was supposed to be a bronze one but the seedlings all damped off and I only had that magenta (ish) one so that was an accident! The fennel leaves are self sown too. Late summer is daisy time. I don’ t want to see them any earlier but they are great for late summer. I love your Irish Eyes. Rudbekias are so cheery. I have grown Prairie Sun this year, and I am delighted with it. So are the bees.